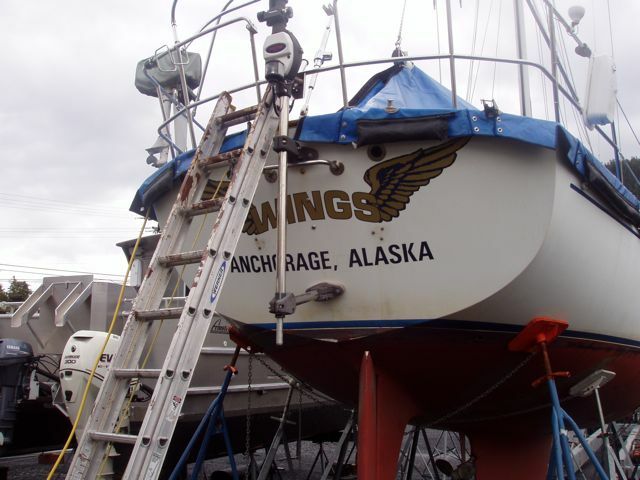 Here are a few photos of Wings up on the jack stands that John Margus used to support the boat. It's interesting to see the system being built. He had six stands per side, plus two more at the bow, by the time that we returned home. Note the semi-permeable membrane below the boat. 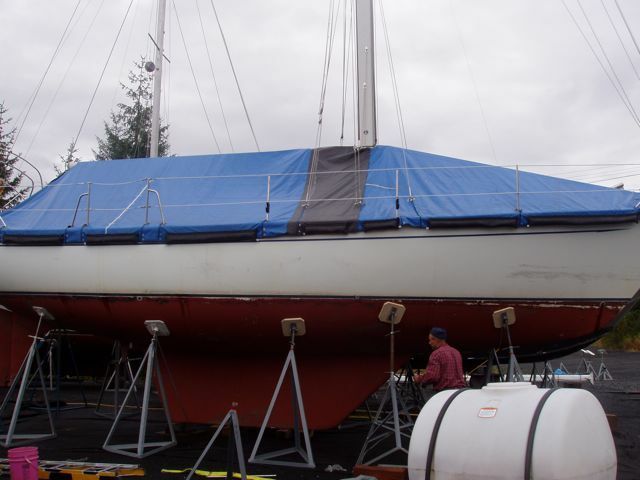 It's used so that paint chips and other detritus falling from the boat cannot find its way into the ground water. The bottom paint is in remarkably good condition. We'll add three more coats to the bottom next Spring. This is the forward-looking sonar transducer, the thing that sends ultrasonic pulses through the water. It's mounted on a wooded block and you can see the mussel shells remaining after the power wash.
Wings port side. 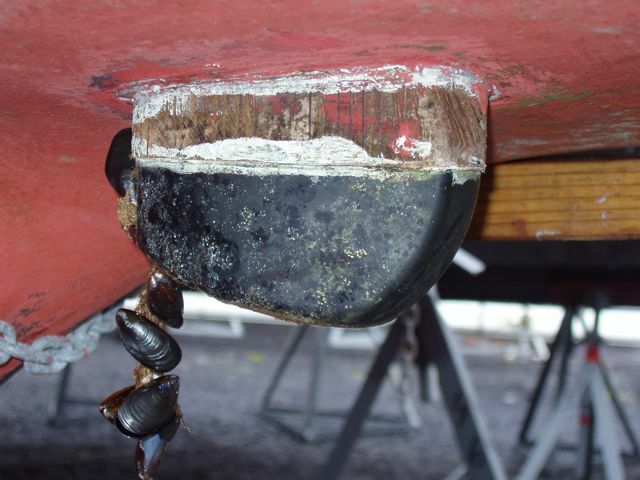 The scuff marks are from mooring buoys. 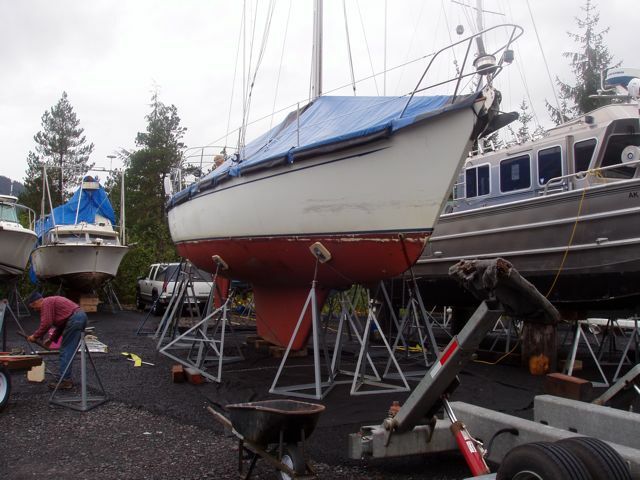 John Margus continues to place jack stands on the boat. All twelve (six per side, two bow) were chained together side to side (each side stand had its opposite number on the other side of the boat), and around the outside. The two bow stands visible. Note the chipping of the paint around her bow. Doubtless, this is due to pushing her through the brash ice around glaciers that we enjoy so much, and exacerbated by normal wear and tear. John's trailer is at right. A good view of the membrane under the boat. During the course of the winter, and as we prep for and apply bottom paint, none of the toxic bottom paint can enter the ground water. 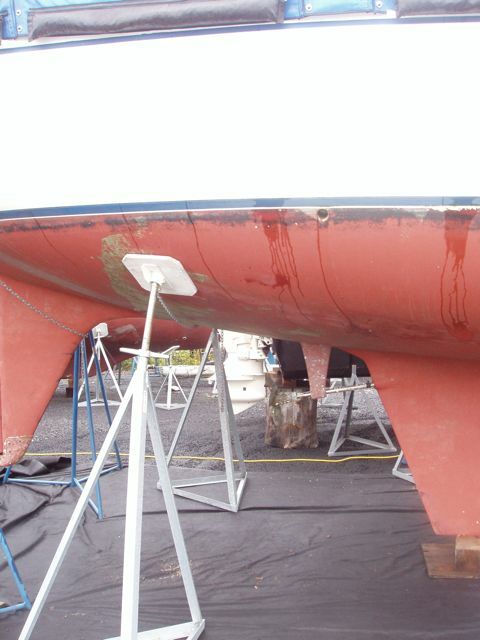 The hull paint is in great condition for three years of immersion! 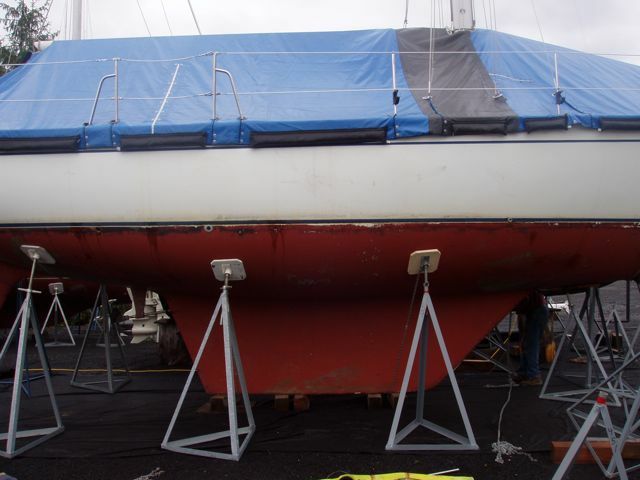 An excellent view of the keel and cover. 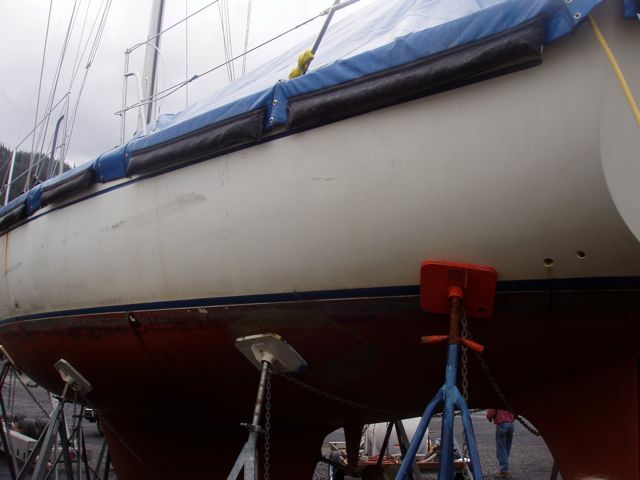 Her bottom is fairly flat although she has fullness at midships for bilge and tankage. Wings' transom. We went up and down this ladder for everything, including taking cats up and down and rest room calls, and in the horizontal rain that assailed Petersburg during the days that we were there. The EPIRB (small box on starboard rail, the Emergency Position-Indicating Radio Beacons) and dinghy motor (port side) were removed to dry storage.